Jules Strauss is a Princeton senior with a full scholarship, acquaintances instead of friends, and a family she's ashamed to invite to Parents' Weekend. With the income she'll receive from donating her "pedigree" eggs, she believes she can save her father from addiction. Annie Barrow married her high school sweetheart and became the mother to two boys. After years of staying at home and struggling to support four people on her husband's salary, she thinks she's found a way to recover a sense of purpose and bring in some extra cash. India Bishop, thirty-eight (really forty-three), has changed everything about herself: her name, her face, her past. In New York City, she falls for a wealthy older man, Marcus Croft, and decides a baby will ensure a happy ending. When her attempts at pregnancy fail, she turns to technology, and Annie and Jules, to help make her dreams come true. 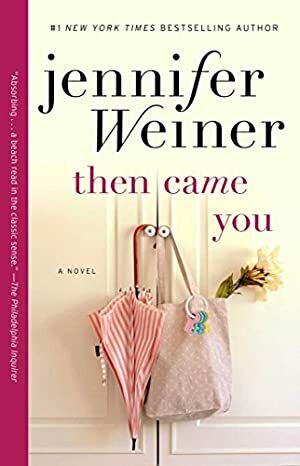 With startling tenderness and laugh-out-loud humor, Jennifer Weiner once again takes readers into the heart of women's lives in an unforgettable, timely tale that interweaves themes of class and entitlement, surrogacy and donorship, the rights of a parent and the measure of motherhood. Track It. This book has been $2.51 within the past year. Log In to track Jennifer Weiner on eReaderIQ. to be notified each time the price drops on any book by Jennifer Weiner. to stop tracking Jennifer Weiner. We started tracking this book on February 18, 2013. This book was $11.99 when we started tracking it. The price of this book has changed 14 times in the past 2,253 days. The current price of this book is $12.99 last checked 3 months ago. This lowest price this book has been offered at in the past six months is $9.74. This lowest price this book has been offered at in the past year is $2.51. The lowest price to date was $2.51 last reached on May 19, 2018. This book has been $2.51 one time since we started tracking it. The highest price to date was $16.99 last reached on November 7, 2016. This book has been $16.99 3 times since we started tracking it. We last verified the price of this book about 3 months ago. At that time, the price was $12.99. This price is subject to change. The price displayed on the Amazon.ca website at the time of purchase is the price you will pay for this book. Please confirm the price before making any purchases.